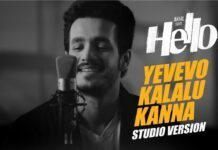 HELLO Movie Television Rights: Akhil Akkineni’s much-awaited action and romantic thriller movie ‘Hello’ is gearing up for a grand release on 22nd December. Currently, the entire team is busy with the promotional activities as the film release date is fast approaching. According to the latest update, popular entertainment channel Zee Telugu has acquired the Satellite rights of Hello for the fancy price of Rs 5.90 Cr. 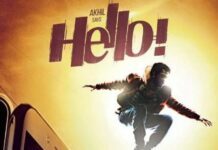 This is a whopping deal considering that Hello is the second movie of Akhil. Akhil Akkineni is paired up with Kalyani Priyadarshan. According to the latest buzz in tinsel town, the highlight of the movie will be its last 30 minutes. The entire film will be narrated within a day and director Vikram Kumar has made it very thrilling by including some dare-devil chases sequences. The makers say that Hello is about the role of destiny and finding true love against all odds. It is bankrolled by Akhil’s father King Nagarjuna under his banners Annapurna Studios and it has the music by Anup Rubens. Recently, at the audio launch of the movie in Vizag, Nagarjuna said, he is fully confident about the blockbuster success of the film.